We provide clients with China Clay that belongs to Kaolinite group of clay. Our range of China Clay is high on demand in the market and it complies with the international standards. Formed by the alteration of felspathic rocks, the array of China Clay that we manufacture is commonly used for sedimentation of grit and mica. Customers can also be eased with the availability of China Clay at the most cost-effective prices. It has good plasticity, does not smell in water, stand high temperature and non-conductor of electricity and heat. The white color and the brightness are the other properties. It is marketed as super-textile, paper, pottery and rubber grades. The grading of the material is primarily done on the basis of whiteness and grit content. The clay lumps first made to slurry with water. Then led off to sand classifier for separation of sand and then to settling tanks for sedimentation and thickening. The obtained clay is dried in rotary indirectly fired driers. It is used in manufacturing of porcelain and chinaware. For this purpose we prefer grit free china clay with some tolerance. It is also utilized in manufacturing of electrical insulators. China clay free from silica and unaltered feldspar is used for electrical insulators. For electrical insulators iron content as low as possible in used china clay. It is also used in production of crockery and paint industry. All users prefer china clay with some tolerance depending upon the end products to be manufactured. In Pharmaceuticals and cosmetic industry china clay is used. They use froth free china clay i.e. the presence of lime should be practically nil. It is used as filter in paper and textile industry. For giving a glaze on paper or textile the colour reflectance of china clay should not be less than 88. 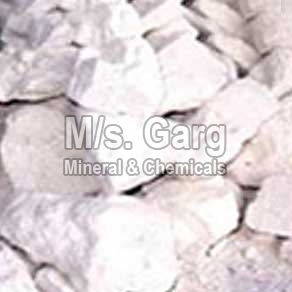 It is utilized in large quantity as filler and reinforcing agent in rubber goods. China clay has light weight and possessing reinforcing properties and should be absolutely free from copper even in minute amount deleterious for rubber.